Hello stampers. Happy Hump Day!! Today's share are the Thank You cards that i made to take to my little scrapbooking/card making weekend that my awesome mom and i go on once (sometimes twice) a year. It is a great time to just do nothing but wear your comfy clothes all day and get creative. I can't wait. Anywhoo, if anyone purchases anything from me i always like to give them a little thank you of some sort. 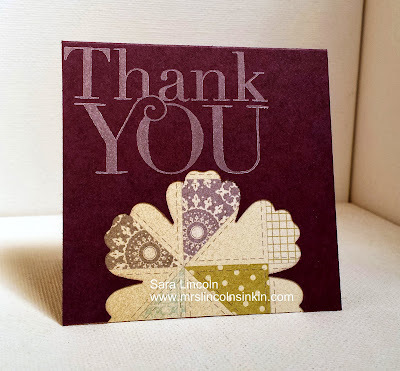 So this year, i decided that i would just do a 3x3 Thank You card showcasing the new Photopolymer stamp set, Another Thank You! This is my FAVORITE Photopolymer set so far. 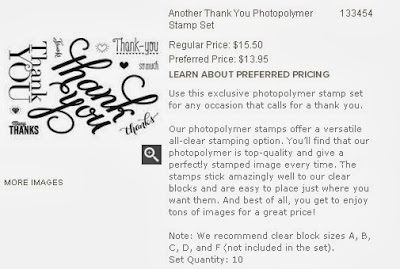 You can never have to many "thank you" stamps in my opinion and this one really give you a great variety to choose from. All from really small sayings to bigger ones!! It' fabulous!!! Each card measures 3x3 and has a Blossom punch somewhere on the front of the card. I didn't want them all to be in the middle so i moved them around a bit. I then cut a piece of 3x3 DSP of Afternoon Picnic and placed that i on the top/inside of my card (so it would show through the punch). I like doing the whole 3x3 piece on the inside because then it helps decorate the inside as well.